Everybody loves free stuff, there’s no questioning that and with the amount of money that we spend on our music equipment it’s nice to be able to indulge ourselves with something free. This article is going to go through a quick run-through of some of the best known and highest quality free software synths there is on the market today. 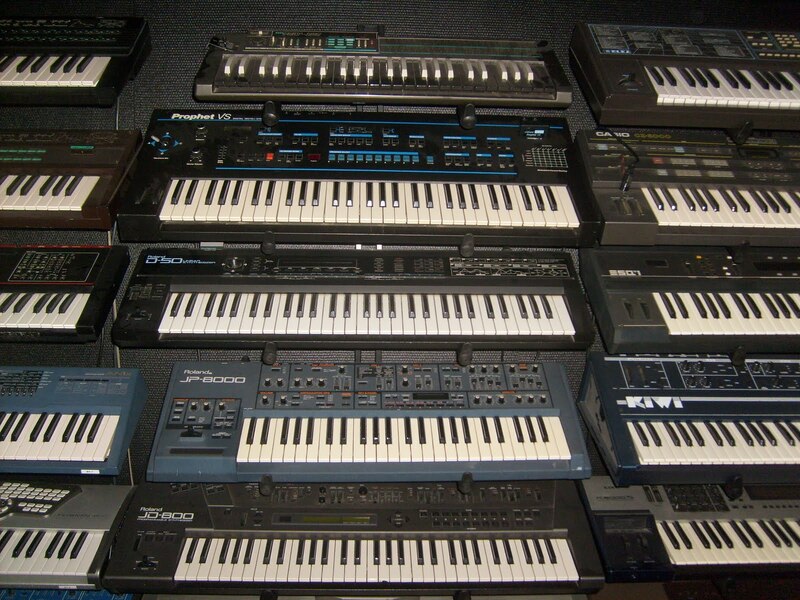 This is just a few of the 100’s of free synths there is so be sure to check out some of the others if none of these tickle your fancy, that being said, we are sure that you can find something in our list that will suit you needs! Let’s have a look . . Crystal is one of the very first synths I had ever used when I began producing music. Sounds really good straight out of the box per say, and has a huge ton of features. 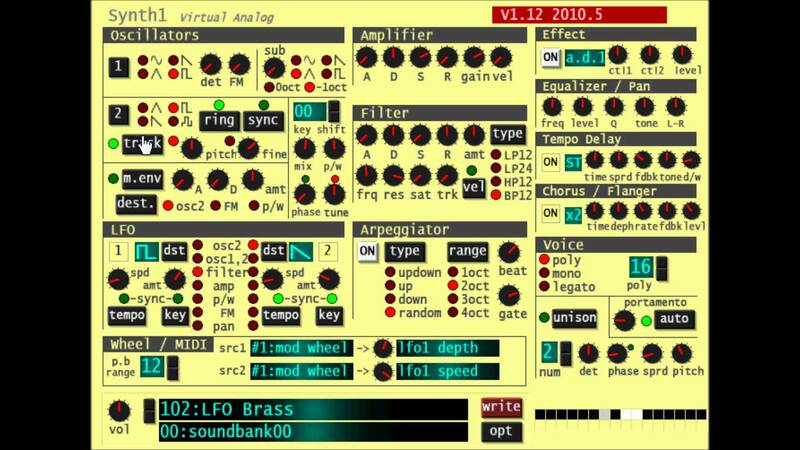 It is a semi-modular software synth featuring both subtractive synthesis and frequency modulation. Boasting over 90 modulation parameters within the modulation control, fantastic visual modulation envelopes with a choice of 8 separate curves, built in effects like chorus, flanger, delay. 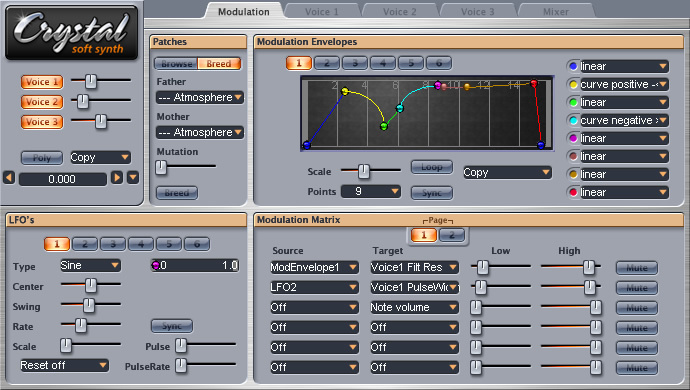 Also featured is a modulation routing matrix. A whole lot packed into a small package! Synth 1, this synth has been the starting point for many electronic musicians it comes highly recommended as the best starting point for synthesis. 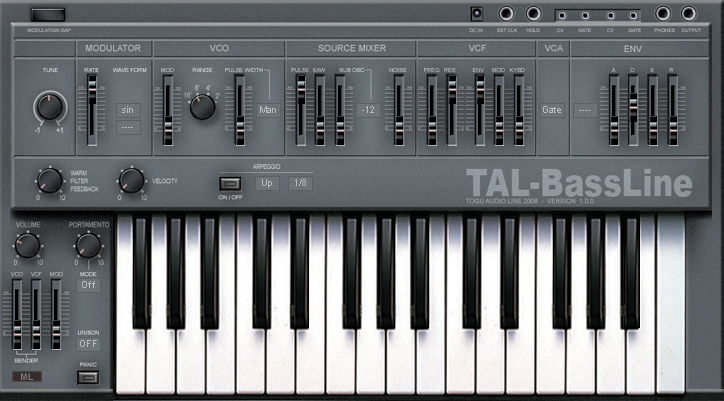 IT was based on the Clavia Nord Lead 2 and was released in 2002. Combining substractive synthesis with FM synthesis, Synth 1 has really pushed the boat out with what you can do with free plugins. It contains three oscillators one with FM modulation, one with ring modulation and synchronisation, and lastly one sub-oscillator, as well as effects and an arpeggiator. Synth 1 also holds the record of being the all-time most downloaded VST plug-in from KVR Audio! u-he are known for releasing many free plug-ins over the years, but one of the stand outs has got to be Tyrell Nexus 6. Many still can’t believe that they are offering this away for nothing! The features of this plugin are similar to what we might expect of that the likes of the Juno series from Roland and it features 2 ossicilators, a sub-ossicialtor, noise generator, ring mod, signal feedback, 2 LFO’s, 2 ADSR envelopes, and a modulation matrix. Based on the world renowned Roland SH-101 synth that was made famous with the sounds of house, drum & bass, techno and in particular acid house! A great little addition to any producers arsenal. Togu Audio Line really did a great job emulating this workhorse that is the SH-101, and is a must for anyone who makes early 90’s techno or Acid house, even a quick download of it to see what it sound like can bring you back to the rave days! Features include, an arpeggiator, LFO, sub oscillator, MIDI automation for all buttons and sliders, Saw & Pulse waveform oscillators, also included is 23 presets for you to get to grips with! Completing our list is Novation’s fantastic synth V-Station! Now I know what you might be thinking, that this isn’t free, but with V-Station it comes bundled with so many different things, interfaces, software, keyboards etc. that it’s hard to avoid it. So i’m fairly confident you will come across it at some stage! You can also get it for FREE when you sign up to our Backstage Area which again, is FREE to do! Anyway, V-Station is a polyphonic synth it contains the same real 3-oscillator flexibility as the award winning K-Station. 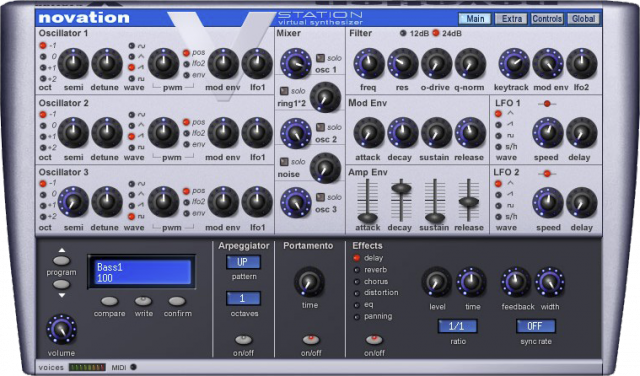 V-Station boasts 3 oscillators, filter section, mod and amp envelope 2 LFO’s and effects. Packed with 20 factory presets and 400 user programs you literally can get straight into making good music! Thanks for reading! Hopefully we’ll see you back here again soon!